Certain words and phrases—quality, safety, process optimization—will almost surely put you to sleep, unless you care about biosimilar production. Then they might keep you awake at night. Although biosimilar production may never let you rest easy, you can at least find reassurance in post-translational modifications, especially glycosylation. Of all the post-translational modifications, glycosylation best reflects the effects of process conditions, including some that are quite subtle. “There are historical examples where scale-up has changed the glycan profile sufficiently to prevent release under a particular label,” says Guillaume Tremintin, market area manager, biopharma, Bruker Daltonics. Biosimilar drugs have similarly been rejected on account of glycosylation dissimilarities with the originator drug. Concerns regarding glycosylation and safety originated during the early days of therapeutic antibodies, when murine proteins carrying mouse glycans were discovered to be immunogenic. Now that humanized antibodies are the norm, glycosylation is still viewed as a critical quality attribute, but in a more subtle way. Similarly, sialic acid is associated with inflammatory responses, which may or may not be desirable for a given biopharmaceutical. Hence the incentive for developers to fine-tune or at least control which sugars are added and in what relative proportions. 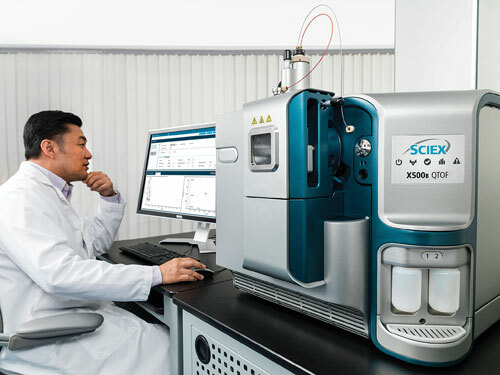 The new X500B system from Sciex is designed to bring simplicity, high-performance, and robustness for biothera-peutic characterization to one of the most compact mass spectrometers on the market. Glycan analysis fits into three general categories. Drug developers can analyze intact proteins, complete with glycans attached, to quantify the number and distribution of glycoforms. Enzymatic digestion elucidates the peptide backbone with glycosylation sites intact. The most detailed analysis cleaves glycans from the protein’s amino acids, either before or after proteolytic digestion, to characterize distribution, sequence, and composition of glycosydic chains. N-glycans require one enzymatic cleavage. Subsequent chemical treatment is required for O-glycans, while treatment with endoglycosidases can be used to further probe sugar-sugar linkages. Hydrophilic interaction liquid chromatography (HILIC) and capillary electrophoresis are the methods of choice for front-end separation. This level of analysis was once impossible and begs the issue of collecting too much information, specifically on clinically irrelevant glycosylation differences that nevertheless trigger costly review of processing or regulatory compliance. Dr. McCarthy dismisses such concerns: “If you ask people in industry, you won’t find even one instance where, with respect to glycans, they’ll tell you they have too much information. There needs to be an understanding when defining the process space of how much deviation is tolerable and how much will affect product quality. No single technology can answer all questions regarding glycosylation or its impact on quality. Analysts value orthogonality, which brings confidence to analytical methods. For its part Sciex leans on well-established capillary electrophoresis for the separation and analysis of glycans. The company is introducing its new Fast Glycan technology for quantitative N-linked oligosaccharides analysis in biopharmaceutical characterization. Research analysts challenged by time-consuming sample preparation and data analysis can now accelerate their workflow through rapid glycan release and labeling, followed by a five-minute separation with immediate glycan identification via glucose unit calculations performed by the Sciex PA 800 Plus software. Mass confirmations involve quadrupole TOF MS with sequential window acquisition of all theoretical fragment ion spectra (SWATH) and independent data acquisition (IDA) coupled with HILIC chromatographic analysis for fragmentation data. IDA uses a precursor ion scan to select the top 10–15 ions and obtains fragmentation data on them. Where SWATH is more comprehensive, IDA is faster but may miss relevant peaks. 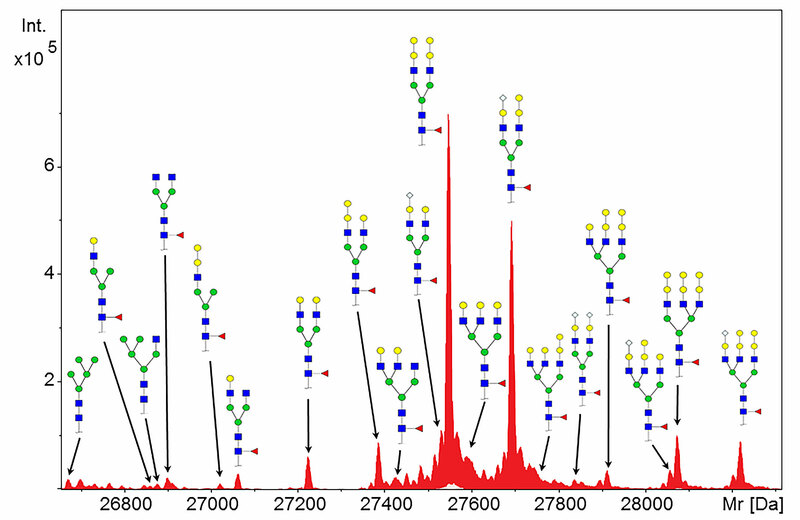 Glycosylation profile of the cetuximab Fd subunit fragment measured on a Bruker maXis II ultra-high-resolution quadrupole time-of-flight mass spectrometer. Conventional glycan analysis samples are prepared through laborious methods, some taking several days, followed by single channel analysis on liquid chromatography (LC) or capillary electrophoresis (CE). Typical steps involved protein digestion, protein removal, carbohydrate labeling, removal of labeling reagent, and chromatography. These methods present numerous challenges, says Baburaj Kunnummul, Ph.D., product manager, Thermo Fisher Scientific: “These include handling hazardous volatile organics, multiple time-consuming steps, and degradation of species such as sialylated glycans during extended high-temperature incubations, followed by instrument set-up and repeated column regeneration during sequential analysis.” These challenges are amplified as the number of samples requiring high-resolution glycan analysis increases. Microchip CE glycan mapping reduced workflows to three steps: digestion, labeling, and direct analysis, and shrinks analysis time to about eight hours. Because it runs up to 24 samples per run, the system is suitable for both high- and low-throughput analytical labs, thus maximizing analyst time for projects related to cell-line development, cell-culture optimization, purification process development, and formulation and stability studies. “The resolution, consistency, and sample number flexibility makes the system ideal in the lower throughput regulated testing labs as well,” Dr. Kunnummul asserts. In late 2016, S-Bio launched the EZGlyco™ mAb-N Kit with 2-AB, which facilitates the rapid analysis of N-glycans in IgG and Fc-fusion proteins from culture supernatant samples in streamlined, single-tube operation. 2-AB (2-aminobenzamide) is a fluorescent label widely used in chromatographic glycosylation analysis. Scientists have adopted it because of the availability of 2-AB-labeled glycan standards and an existing database for elution positions of glycans with HILIC. Like most labels, EZGlyco is applicable to upstream exploratory work, including media optimization and process optimization. It is also suitable for process analytics and quality control. Conventional 2-AB methods to release, label, and purify N-glycans typically can take more than half a day. Some N-glycan analysis kits are much faster but require protein purification before analysis. S-Bio also provides analytical services based on its proprietary Glycan Map® platform, which provides rapid characterization of both N-linked and O-linked glycans in glycoproteins. GlycanMap combines BlotGlyco® bead-based glycan purification in an automated sample-processing system with high-throughput MALDI-TOF mass spectrometry to generate reproducible glycan profiles. Perhaps the best way to guarantee favorable glycosylation patterns is to build them into the process. This would make analysis more of a routine operation, particularly for the benefit of regulators who closely examine biologics filings. Thermo Fisher’s feeding supplement, Gibco GlycanTune™, provides precision and control in predictively shifting glycan profiles. Since it’s based on the Gibco EfficientFeed technology, GycanTune also enables a multifold increase in titers, thereby maximizing bioreactor utilization. Until relatively recently, control over glycosylation was dictated by the expression system, either through innate capability or more commonly by selecting specific clones. In the latter case, developers needed to screen many clones and/or spend significant resources optimizing cells engineered to express specific glycoforms. We now know that media/feed components, and even process parameters, can affect glycosylation as well. GlycanTune provides nutrients to achieve this. GlycanTune Total Feeds provide components needed to move glycan patterns from mostly G0F to G1F and G2F glycoforms. This is based on the inclusion timing during feeding. The products also contain standard feeding supplement components so that they can be used as a substitute for other feeds when the time is right to gain the desired glycosylation shift. Feed timing can be determined experimentally using kits and protocols provided by Thermo Fisher. This option is particularly useful for scaling feeds for processes up to thousands of liters. GlycanTune feeds are reconstituted by water addition without pH adjustment to deliver up to 200 g/L of nutrients. Super concentrating to 2× or 3× allows for the addition of large quantities of feed without diluting the final product stream.